Camelia was born in Romania and migrated to Australia in the early 1980's. She has enjoyed being creative and enjoyed painting and drawing from an early age. In 1990 Camelia started watercolour painting as well as pottery as recreational hobbies outside work. Camelia's career and background is architectural, so the hobbies just fed her creative nature. Since 2000 Camelia has been concentrating mainly on her artistic career by getting involved with the Artist Society of Canberra and attending workshops and classes to improve her work. Camelia has been involved with the organization of workshops and the coordination of two annual exhibitions for the Artist Society of Canberra. 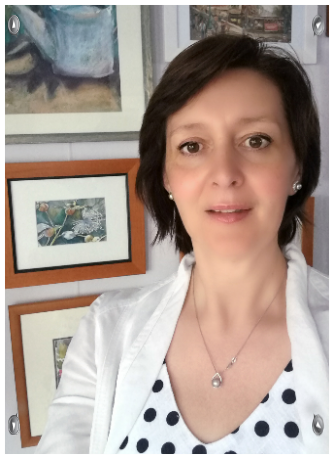 After the birth of her son in 2005, Camelia is still working on her artistic career as time permits and still exhibits locally at various art shows. As of October 2010 Camelia has been the coordinator for the friendship group Art In Miniature Canberra (A.I.M.). November - Camelia was invited by Peter Batey to exhibit with three other local members at the launch of a rare chamber music recital at the Old Gaul Gallery in Gundagai. Exhibited localy with local artist groups. March - Camelia and a group of eight artists held a joint exhibition at Sweet Copper. July - Three of her art works were accepted into the Camberwell in Melbourne. August - Camelia and the Ladies in Painting group held their 1st group exhibition at Yarralumla Gallery. Ladies in Painting: Sharon Buckland, Karen Hall, Michele O’Loughlin, Narelle Sheppard and Camelia. August - First featured in the Australian Artist Magazine, August edition. February - Exhibited for the first time at the Sydney Easter show. Camelia is a member of the Artist Society of Canberra, Art In Miniature, Queanbeyan Art society, and Canberra Potter’s Society. She exhibits works with the groups mentioned at their annual shows. Her work is produced in her home studio in Kambah Canberra.